For an employee to effectively perform in the workplace, he or she needs to have a specific and unique set of vital technical skills. But what about non-technical skills? Skills that govern an employee’s ability to communicate, form relationships, and prioritize tasks are often overlooked in education and training. Unfortunately, these “soft skills” are just as crucial to business success as the more recognized “hard skills.” In this article, we focus on why soft skills are important to your business, and what you can do to ensure that your workforce has the personal skills necessary to remain viable during the communication age. When you’re hiring new employees, what is it that you look for? You want someone who is capable of completing the tasks you assign them. After all, if your IT specialist doesn’t know the difference between BYOD and BYOB, then your company might find itself in a less-than-enviable situation. Technical skills are indescribably important; a truck driver is only valuable to his shipping company if he has the technical knowledge necessary to operate a truck, and a surgeon who lacks a fundamental understanding of surgery is a danger to her patients. However, are technical skills, or hard skills, all that one needs to be a valuable and viable asset in the business world? Because there’s more to employment than simply knowing “how” to do a job. The National Center for Education Statistics (NCES) projects that over 1.5 million students will graduate with a bachelor's degree in 2014. These new potential employees come “preloaded” with the requisite technical skills that their careers require. Yet, despite this, many find themselves unable to adequately perform in a competitive marketplace due to their lack of interpersonal skills otherwise known as soft skills. There it is, the thing that colleges still haven’t quite gotten a handle on instilling in their graduates. Because despite the supposed “disconnect” of the digital age, humanity is still a very social species, and unless we as individuals understand how to communicate, cooperate, and coordinate with others, we are at a significant disadvantage—especially in the workplace. 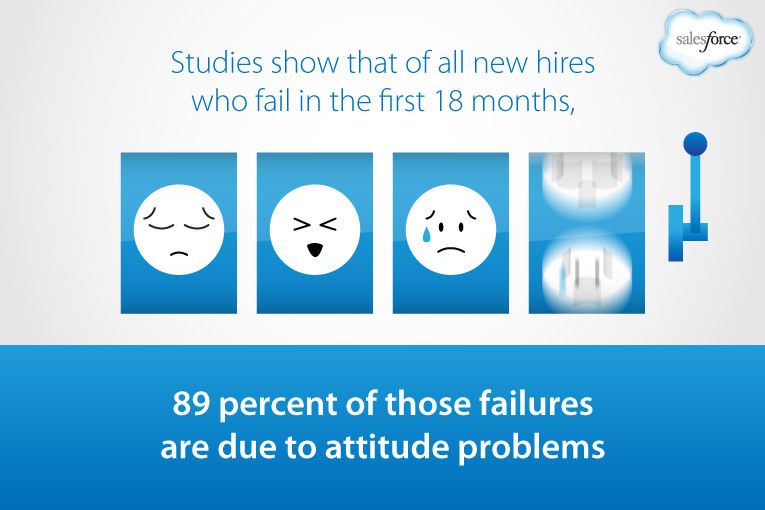 In fact, according to Mark Murphy (author of Hire for Attitude), 46% of new hires fail in the first 18 months, and of those new hires, 89% fail for reasons associated with attitude. Yes, we're all adults, but we all have different approaches to getting things done and interacting with one another. 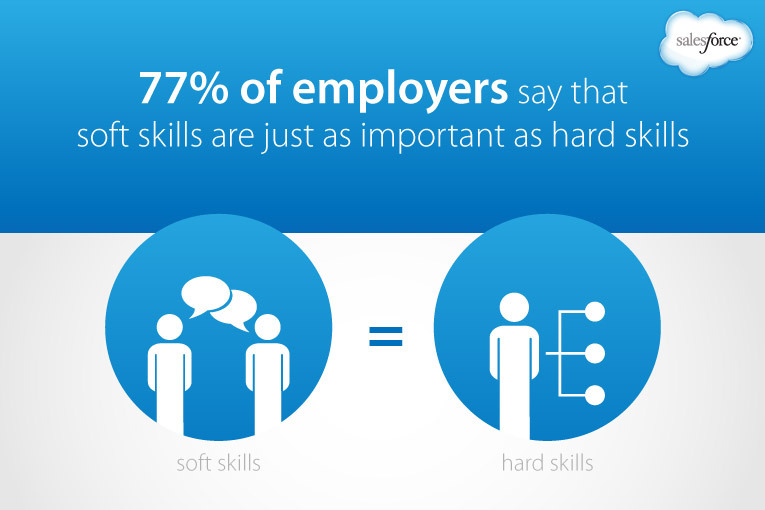 There's a reason why 77 percent of employers say that soft skills are just as important as hard skills. In a workplace, the diversity in experience, demeanors, age, goals, and cultures, sometimes all on the same team, means we have to be able to juggle a varied set of personalities and end up at the same end point. Between formulating meaning on our brains, and expressing that meaning through our mouths, there’s a lot that can go wrong. Sometimes we assume that the recipient has access to specific information. Sometimes there are inconsistencies in the perceived connotations and denotations of the words we’re using. Sometimes nonverbal implications are missed. Whatever the case, this is called signal amplification bias, and it is a very real danger in the business world. The ability to step outside of your own mind and place yourself in the shoes of the recipient of your communication is a soft skill that too few workers currently possess. When professionals communicate without thought of how their communications will be received, it inevitably results in confusion, misunderstandings, and delays. These misunderstandings are anything but harmless; according to the Mitchell Communications Group, miscommunication costs businesses $37 billion (or $26K per employee) in the U.S. and U.K. every year. On the other hand, organizations that learn effective communication are nearly five times as likely to retain the best employees. Teach your employees to avoid assumptions at all costs. Unless information is explicitly spelled out, it is impossible to know whether or not the recipient fully understands what is being shared. Overly complex messages, communication barriers, and mistrust can also play a part in preventing important data from being accurately understood. As such, those who possess the skill to be able to overcome these natural impediments when communicating can end up saving their companies substantial amounts of money. Unless your business consists of a single employee working out of a garage, its success depends heavily upon the ability of its staff to cooperate on projects in order to achieve company goals. Of course, any time that two or more people have to work together, conflict is sure to arise. This is because no two minds approach problems in the exact same way. 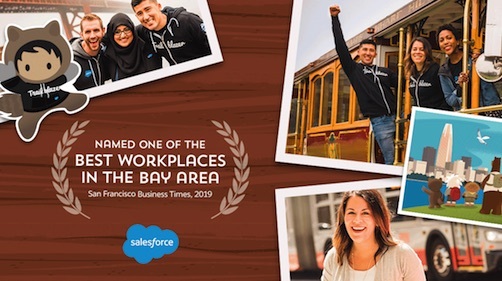 This isn’t necessarily a bad thing—the unique perspectives and experiences that each of us carry with us are what make collaboration so profitable. After all, the more angles that are available, the more solutions you have from which to draw. However, when those involved in the collaboration lack the soft skills necessary to be able to give and accept criticism in a mature way, it becomes impossible to reach any sort of mutually beneficial resolution. Instead, you end up with wasted time, strained business relationships, and failure. 86% of executives identify ineffective collaboration and communication as a major cause of failure in business. However, those who develop and maintain the necessary interpersonal skills to make collaboration work the way it’s supposed to are worth more to a company than the sum of their collective hard skills. Unfortunately, most education courses and on-the-job training neglect to cover these all-important skills. Consider investing in special training and team-building courses for your employees to help counter this particular weakness. Given the competitiveness of today’s market, most employees don’t have the luxury of being able to focus all of their efforts on a single project before moving on to the next one. Instead, they’re given multiple assignments at once, and are then left to their own discretion as to which should take precedence. The problem is that prioritization is a soft skill that is seldom addressed directly. Colleges don’t train in prioritization, assuming instead that students will either naturally adapt to heavy workloads or will fail to graduate. Likewise, companies don’t generally bother to instruct employees on how to effectively prioritize, because it is assumed that the skill would have been learned in college! The inevitable result is that workers often choose either to focus their efforts on projects on a first come, first served basis, or they wait to be micromanaged by those higher up in the company. This is an issue that many managers recognize. According to NACE’s Job Outlook for the Class of 2014, the ability to plan, organize, and prioritize work is ranked as the third-most desirable quality in a new hire (ranking behind only the ability to make decisions and solve problems, and the ability to work in a team structure). Perhaps the best way to improve this skill in your employees is through a mentor-protege relationship, where those who have the skill are able to teach by example to those who do not. A decade ago, social media as we know it didn’t exist. Now, it’s difficult to even imagine life without it... and business life is no exception. 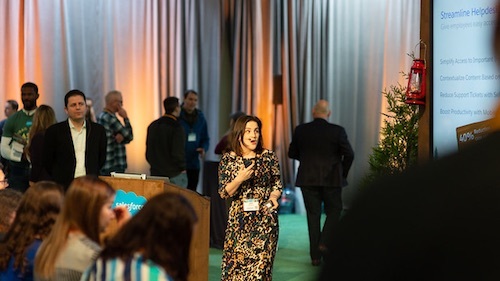 Today’s businesses use social media to promote products and services, address customer concerns, and connect with their intended audience in ways never before possible. This is likely why social marketing budgets will have doubled (on average) between now and 2018. 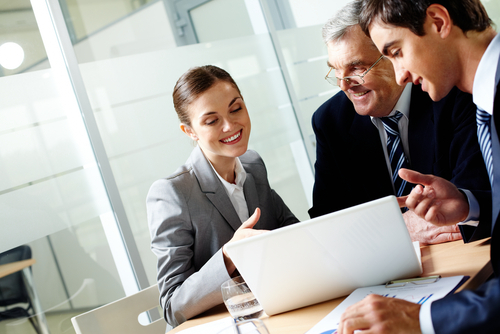 But as businesses become more and more social, employees are expected to follow suit. These are the employees who will be representing their companies—in essence becoming the face of the organization for potentially hundreds of thousands of social media users. 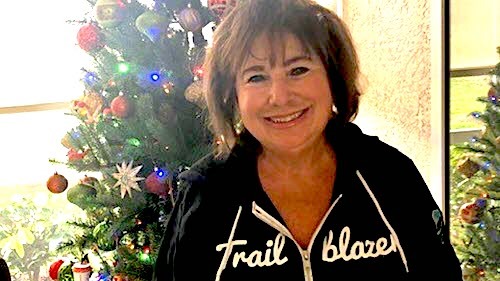 If these employees don’t understand the basic precepts of dealing with other human beings in a calm and professional manner, then you could end up with a situation similar to the very public social media meltdown that Arizona restaurant Amy’s Baking Company shared after receiving online criticisms. Likewise, as social media becomes more fully integrated into business infrastructure, many organizations are beginning to use social media platforms for intra-office communication and training. As such, even those whose jobs require no direct interaction with the public are having to deal with the complicated rules of etiquette inherent to social media. Special workshops may help your employees to develop the soft skills necessary to using social media productively and effectively while at work. So, while it may be vitally important for a surgeon to know how to make incisions, or for a truck driver to understand how to shift gears, there are often other overlooked skills that are nonetheless crucial to success in any position. After all, this is an age of communication and sociability, and those who have trouble effectively interacting with others in a congenial way will find themselves at a significant disadvantage in the modern workplace. When you bring on new people, be sure to look at more than simply their resume and education; take a step back and see how easily they handle personal communication. Contact former employers and personal references, and don’t simply ask how well the prospective hire performed the actual job itself, but instead focus on their overall attitude and how they functioned as part of a larger team. Above all, make sure that soft skills are a priority in your business, and that your people know it. Because, when you get right down to it, this may not be kindergarten, but your people should all still know how to play nice.